A simple and refreshing raita with tomatoes and spring onions, flavored with chaat masala and black pepper and a great accompaniment for chapathi and rice dishes. 1. 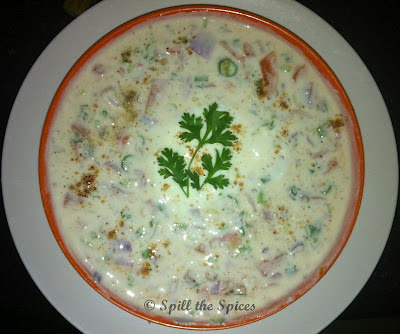 In a bowl, mix together onions, tomatoes, spring onions - white & green, green chillies, coriander leaves, curd, chaat masala, black pepper powder and olive oil. Refrigerate for 1/2 hour. 2. Just before serving, add fresh cream, lemon juice, sugar, salt and mix well. Addition of fresh cream is going to make this very yummy...will try it out.